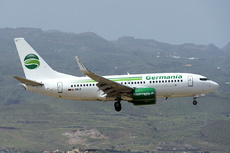 Germania flight ST6129 was involved in a takeoff incident at Las Palmas-Airport de Gran Canaria in the Canary Islands, Spain. The aircraft was authorized by the Tower controller in the local position (LCL) to cross runway 03L and align and wait on 03R. The aircraft crew reported that the red lights on the stop bar were illuminated on taxiway S4. The LCL controller re-authorized the aircraft to line up and wait on the runway and then take off. At that time a work was being carried out on track 03R/21 L and a vehicle was present just off the right side of the runway. Because of that, once the GMI6129 aircraft had started the takeoff run from runway 03R, the LCL controller instructed it to cancel take-off. Maximum speed reached was about 60 knots. The aircraft passed the vehicle and the takeoff was safely aborted. The incident was caused by a loss of situational awareness of the controller, who instructed the crew of GMI6129 to enter and then take off from runway 03R, even though he knew it was closed. - The controller did not detect the error even though the visual aids in the tower indicated that the runway was closed. He neither visually detected the presence of the car near runway 03R, although possibly contributing was the fact that the car did not have active anti collision lights. - The controller partially heard a communication from the crew that indicated that the stop bar was active, however he did not request a repeat of the communication and instructed the aircraft to enter the runway and lign up. - The crew crossed an illuminted stop bar, without having information that there were ongoing contingency measures for not being able to shut it down. Regulations regarding stop bars and the manuals deriving from it are not clear and specific. - The aircraft crew started the take-off run despite having visual contact with the car that was standing to the side of the runway. - The mitigating measure of placing cones on the threshold of the closed runway was not implemented, since the minutes of the meeting of the Local Runway Safety Committee where it was proposed were not approved.